Goldman, born in Russia, arrested in America, an accomplice in the attempted assassination of industrialist Henry Clay Frick, is perhaps the best-known anarchist in our history. She makes an unlikely emigrant evangelist. But the pull of America was so strong — the promise of it so great — that even a hardened revolutionary felt it. The story of how those waves of millions, and those groups who came before and after, cascaded upon American shores is told brilliantly, even unforgettably, in Tyler Anbinder’s “City of Dreams,’’ a chronicle of the ultimate American story, told with a comprehensiveness and a whispery understatement that redeem the word “epic’’ in its the subtitle, perhaps the only such usage this season that is not an overstatement. And it arrives in time to offer needed context to one of this election season’s major preoccupations. “The story of immigrant New York,’’ Anbinder tells us in his prologue, “is truly the story of dreams’’ — in this case a recurring dream that had its beginnings in early New York, for by the middle of the 17th century the primitive settlement was already remarkably diverse, its nearly 20 languages producing what one Dutchman described as a “Babel of confusion.’’ In fact, the people who seemed most foreign were the English. There was toleration — to a point, though eventually toleration would be the point. In the beginning — three centuries before the Second Avenue Deli, which opened in 1954, became an American cultural touchstone and its extra-lean, tip-tongue sandwich, now priced at $23.95, an American delicacy — Jews were singled out for opprobrium, forbidden to build synagogues for their “abominable religion,’’ barred from standing guard with the local militia, and then, in a peculiar twist of illogic, taxed for not standing guard. Later they were allowed to become bakers and butchers, though not to vote. Likewise, Lutherans struggled, not being permitted to have ministers. By 1700, Catholic priests also were barred. Anbinder shows us how deriding the latest batch of immigrants became a New York tradition, a cliché of cruelty that endures to this day. Even so, the city was a magnet for what he describes as “men and women of modest means who had heard that New York offered ambitious newcomers many paths to upward mobility.’’ This likewise remains so to this day. Enduring as well is a certain New York libertine style, where “ante-nuptial fornication,’’ as a visiting Anglican minister gingerly characterized it, was regarded as unremarkable. Passage to America was, until the end of the 19th century, an endurance test. 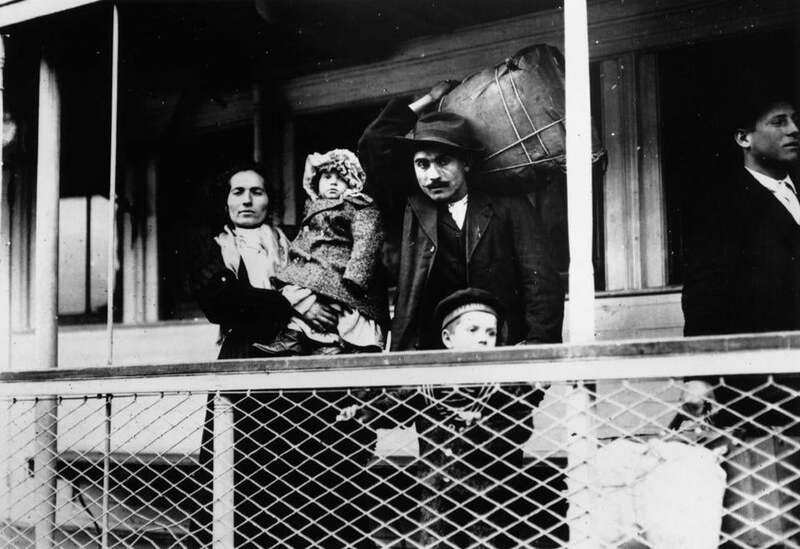 Regardless of the point of origin, the central problem immigrants faced was basically the same: how to assimilate while retaining traces, or more, of their origin. But this sub drama played itself out as endless waves of new Americans coursed across the sea. Anbinder is particularly strong on the ocean passage of the Irish (unbearably difficult), the travails of the Irish (especially those of female domestic servants), and the barkeeps of the Irish (for he tells us that “the bar-keeper whose name has in it a flavour of the shamrock’’ won special favor). Perhaps the central 19th century events in immigrant New York were the Civil War-era draft riots, which expanded into race riots as immigrants, primarily the Irish, rebelled against the notion that, as Anbinder explains, the governing Republicans cared more about black slaves than about them. The great irony is that only a handful of immigrants actually were drafted. Anbinder’s book has all the classic elements of this story — the ascendancy of Tammany Hall, the rise of Samuel Gompers, the tragedy of the Triangle shirtwaist factory fire, the reform instinct of Jacob Riis, the flood in our own time of Dominicans, Chinese, and West Indians (but very few Mexicans, until recently, when they are, Anbinder says, “numerous everywhere but dominant almost nowhere” in the city). But he fills out the story with fascinating details: the structure of an immigrant ship; the ordeal of passing through inspection; how Italians became barbers and tailors; how Dominicans became livery drivers and operated bodegas; how the various ethnic groups distributed themselves in New York in a rough approximation of their place on the globe, with the French, for example, settling in the city near the Spanish; how the architecture of the New York tenement evolved over the years — and how the 18-inch air shaft in so many of them amplified sounds, carried odors, and spread fires. This is a story of city bosses and labor chieftains, of revolutionaries and mobsters, of great fears (of being labeled a “lunatic’’ or “idiot’’ or “imbecile’’ at Ellis Island) followed by great struggles (in domestic service and sweatshops, behind push brooms and pushcarts), of great myths (no one had his name changed at Ellis Island), great injustices (the dispatch of Japanese Americans to internment camps), and hard truths (the way ahead, and the American way, involved as much luck as work). “The story of immigrant New Yorkers changes constantly on its surface,” says Anbinder, “yet not at all at its heart.” So while this is a New York story, it really is an American story, one that belongs to all of us. If, at the end of this massive work, nearly 740 pages of small type and miserly margins, the reader is left with one wish it could be this: That Tyler Anbinder, who teaches at George Washington University, might move to New England to take on Boston’s immigrant story.